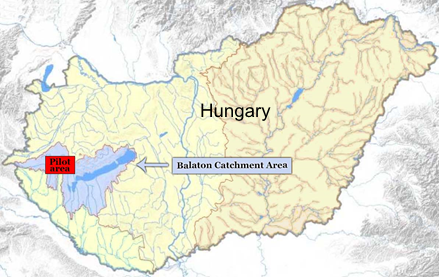 The case study area is situated within the 5765 km2 Balaton catchment area in western Hungary (Figure 9). The climate is moderately warm, moderately humid, while the number of sunshine hours per year is high. Mean annual temperature of the region of Lake Balaton is about 10 ˚C. The average rainfall (600-700 mm/year) nationally means a medium rainfall zone. The center of the pilot area of 744 km2 has the following coordinates: 46°50'0.99" N, 17° 6'14.68" E. The entire pilot area (744 km2) has available DEM (5x5 m GRID), topographical maps with 0,875 m/pixel accuracy, orthophotos with 0,5 m/pixel accuracy and cadastral maps. There are 1:10 000 scale soil maps available from about 20 000 ha. The main environmental objective being the reduction of pollutants (phosphorus and other plant nutrients) loads of into Lake Balaton, where anthropogenic eutrophication is the main issue of concern. Lake Balaton, with its nearly 600 km2 area, is the largest shallow lake in Middle Europe. The lake and surrounding area form very important natural (ecological, water and landscape) resources and are one of the major target areas of water related recreational tourism in Europe. Figure 9. The location of the case study area (Hungary). Over 37% of the total catchment area is arable land, which is much lower than the national average; while 27% is forest, which exceeds the national average. Some 15% of the land is suitable for grassland management, 5% horticulture, 3% pomiculture, 2% viticulture, 1% for reed management and fish farming. The „Kis-Balaton” nature conservation area, is situated within the Balaton Catchment area. The „Kis-Balaton” wetland habitat is under protection of the Ramsar Convention. The distribution of soil types in the area is given in Figure 10. There are several ways to assess soil quality in the case study area. Essentially, the cadastral maps from the case study area contain soil quality information according to the national land evaluation system, namely the „Gold Crown System”. However, a new land evaluation system (D-e-Meter System) has been developed in Hungary which is suitable to use for soil quality assessment in different farming systems within the case study area. The newly developed system applies large scale (1:10 000) digital soil maps, data on soil nutrient status and includes land evaluation algorithms to assess the production potential of agricultural parcels. Figure 10. Distribution of the main soil types.